Possibly the most delicious preserve in the world! The Golden Berry (Hjhortron) from northern Sweden. A treat served on toast, waffles or desserts such as ice cream. 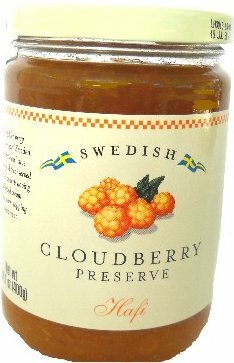 The cloudberry is rich in vitamin C and has a very characteristic and exotic flavor. Ingredients: Sugar, Wild cloudberries, Pectin (gelling agent), Acidity regulator (citric acid), Preservative (potassium sorbate). Total Carbohydrate 12g - Sugars 12g - Protein 0g.